Metal detectorists have reported finds of large amounts of Roman metalwork from fields around Tai Cochion, close to the Anglesey shore of the Menai Strait. Regular reports of Roman finds in the fields between Barras and Trefarthen were also made to the Cambrian Archaeological Association during the 1860s. It was assumed at the time that they indicated the remains of a high status Romano-British site. The information from metal detectorists showed that the site was producing an unusual amount of high status material, suggesting a Roman site with links to the military. It was therefore decided to investigate the area using geophysical survey. The survey was carried out in three phases, all grant aided by Cadw. The first was part of the pan-Wales Roman military sites project (Hopewell 2009, GAT report 778) the second, part of the Anglesey AONB (G2076) project and the third, funded by a Cadw contingency grant, again part of the Roman military sites project (G1632). In excess of 20 hectares was surveyed most of which was found to contain elements of an extensive settlement. The settlement comprised a 0.6km long road with several side branches, running from Tai Cochion house to the shore of the Menai Strait. The roads were flanked by a series of small enclosures, with typical dimensions of about 20m x 40m. Many of the enclosures contained fairly clear, rectangular anomalies that are best interpreted as buildings, with typical dimensions of around 16m x 8m. About 25 possible buildings were detected by the survey. Most appeared to be rectangular, possibly with internal subdivisions. A few seemed to be more complex with extensions or additional rooms. The western and southern parts of the settlement were fairly regular with one building in each plot. The northern and eastern parts were less regular and more difficult to interpret. This could indicate either the presence of several phases or an area of different activity. Scatters of possible thermoremnant anomalies throughout the settlement could indicate hearths ovens or furnaces. The plots appeared to be defined by small ditches but there were no obvious signs of substantial defences around the settlement. Several phases of fields were detected to the north of the settlement. Some could be identified as boundaries shown on an 18th century estate map but others could be associated with the settlement. A surface finds collection comprising 207 sherds of Roman Pottery was made in the field to the south of Tai Cochion. These were examined by Peter Webster and were found to have a date range of c. AD 100 to c. AD 300. The majority was high status 2nd century material suggesting the presence of a Roman site of some importance. 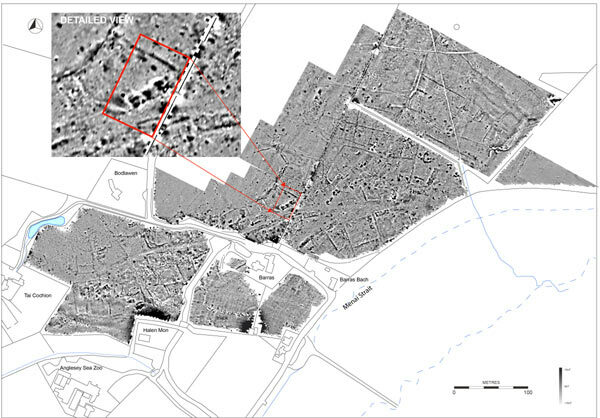 The geophysical survey results and finds strongly suggested the presence of a Roman settlement, as opposed to a Romano-British roundhouse settlement suggested by earlier studies. The layout, with a central road flanked by plots containing rectangular buildings, is similar to Roman villages and small towns such as Sedgefield near Durham (Info from Dr D. Mason in Burnham 2007). The position of the site on the opposite side of the Menai Strait to Segontium Roman fort suggests that the settlement marks the crossing point of the Menai Strait. It is likely that a settlement would have grown up around the landing place and that it would have functioned as a trading point with the inhabitants of Anglesey. A 40x20m area of assessment excavation was carried out in the summer of 2010 encompassing geophysical anomalies that had been interpreted as a rectangular building, a road, and plot boundary-ditches. The project was carried out as a 3-week-long community excavation using volunteers of varying experience, supervised by David Hopewell and George Smith from GAT. The project was designed to provide an assessment of the archaeological potential of the area, test the interpretation of the geophysical survey and to identify any features present. It did not, however, aim to fully excavate major features. The site was excavated down to the first archaeological horizon and recorded. Selected features were then sampled. This provided a good general overview of the archaeology and allowed the recovery of finds from stratified contexts while leaving the majority of features substantially intact. The excavation results confirmed the geophysical survey interpretation. An eight-metre-wide road of typical Roman construction crossed the south-eastern corner of the site. To the west of this was a 14m x 5m rectangular building, probably with stone foundations and a wood, wattle and daub superstructure. This had been burnt down and appeared to have been substantially robbed of building materials. The plot ditches were found to be relatively slight and would have functioned as boundary markers and drains and did not appear to be defensive in nature. The building was separated from the road by a metalled yard. The area to the west of the building contained pits, patches of burnt material and a six posted granary. Close to 1000 sherds of pottery were recovered along with several coins including some from stratified contexts. Preliminary analysis suggests finds from the early to mid 2nd to the mid 3rd centuries. Finds of Roman material from several fields on the shore of the Menai Strait suggested the presence of a site of some importance. Gwynedd Archaeological Trust has carried out extensive geophysical surveys and two seasons of excavation (with the help of many willing volunteers) revealing a large Roman or Romanised civilian settlement. The two assessment excavations uncovered a 7.5m wide road and two large rectangular buildings. The settlement appears to have developed around the crossing point from Segontium Roman fort on the mainland. This is the first civilian small town to be identified in north and mid Wales and is of great importance to our understanding of the interaction between the Roman army and the local population. Please bear in mind that this is ongoing research and the post-excavation process is just beginning; the current conclusions will be updated when detailed dating evidence becomes available. The interim report on the 2011 project can be downloaded as a PDF.